A monk has just gone from one temple to another after he kicked a mentally ill man who hurt his son. 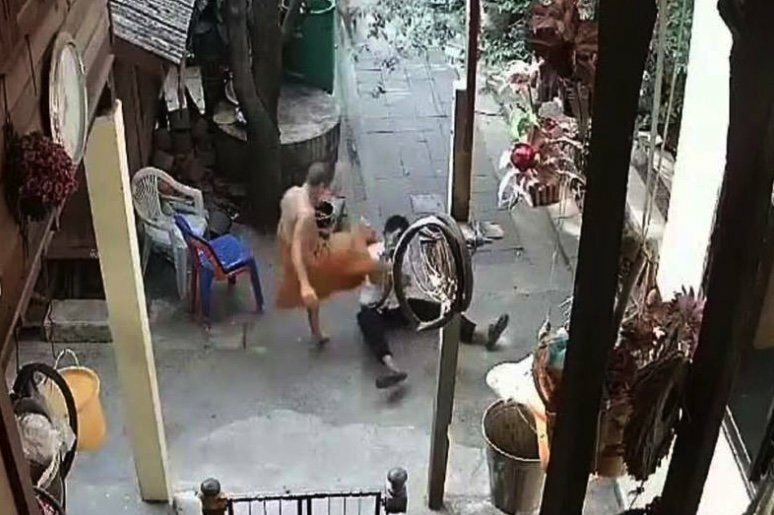 Video of the attack posted on social media shocked netizens and led Daily News reporters to the temple of Wat Suansom in Phrapadaeng, Samut Prakarn. Abbot's helper Phra Adisak said that the man responsible for kicking "Bird" - a guy being treated for mental illness - was Sathit aged 38. He got cross after Sathit's 6 year old son came to ordain at the temple and got involved in some over the top play that hurt the little boy. But Sathit was no longer at the temple. Bird's mother had filed a police complaint against Sathit who was in charge of development at the temple and had been there for two years. It was agreed that charges would be dropped if Sathit left town and transferred to another temple. He is now a monk at Wat Nai in Chonburi. been watching to many reruns of Kung Fuuu. Is that the same as an inactive post? At least if he's inactive it would prevent him delivering another kicking. Seems no different to any 'other' government employee being transferred when caught cheating. May be Exorcism? 'Mentally ill' and 'the Devil inside' going sometimes hand in hand..
More like ; he'll become other peoples/temples problem. Why even bother being a monk? After a loss of control such as that, it would be best to take off the robes and stop pretending to be a compassionate Buddhist monk. Well, the police know where he is. Now go and arrest him for assault. Right after it snows in Bangkok will do. Sathit's 6 year old son came to ordain at the temple and got involved in some over the top play that hurt the little boy. Hmm, if a mentally ill man hurt my 6 year old son, I wouldn't be all smiles either. I guess they learned that old religious dance the "Clergy Shuffle" from the Catholic church.